Back To The . . . Whatever. By most people's definitions, my wife and I are both trained artists. Our relationship started in the art room of what used to be, a progressive looking high school that paid a lot of attention to art and technology classes. (Sadly I know this is not the case any longer) Together and apart, we've taken more formal "art" classes than most people who graduate with an "art" major. It seeps into my woodworking some, but truthfully neither of us have made much use of this training other than raising our girls. We've consciously tried to bring them up to be imaginative creators and makers with pragmatic roots. There is a lot of drawing, painting, and sewing that goes on in my home. The sense of this has ramped up recently as I've been more visibly drawing myself Sitting at the drafting table, doing illustrations of joinery and other concepts to accompany the book I'm working on. My activity has seemed to spur more drawing activity by the girls, and some light arguing about who gets to use the Drawing Board. 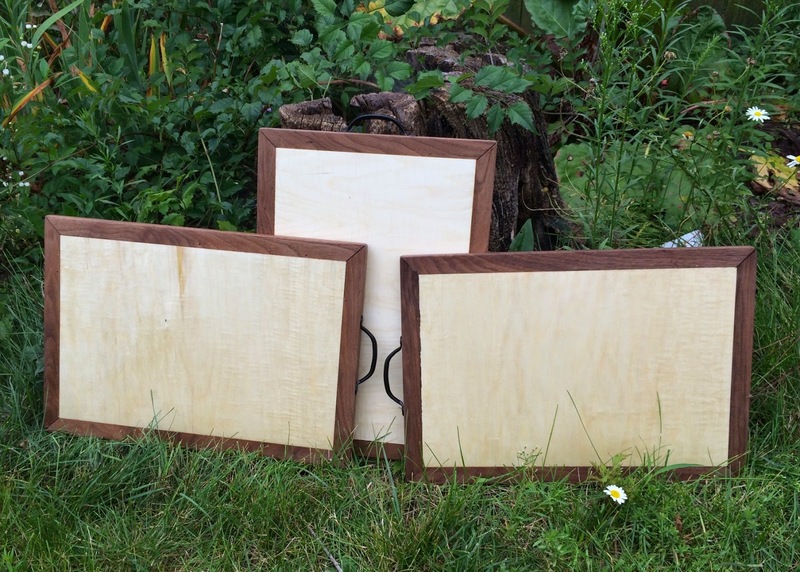 Our portable drawing board is 24" x 30" edge glued maple boards with oaken breadboard ends and a handle screwed to one side. It's a holdover from our art room days and we only have the one. One board and three daughters is problematic. The old soldier drawing board. It's been around a while. Two of the three girls had birthdays coming up, we purchased new sketchbooks, drawing pencils, and kneaded erasers and I built some new drawing boards. One for each, including the non birthday girl. 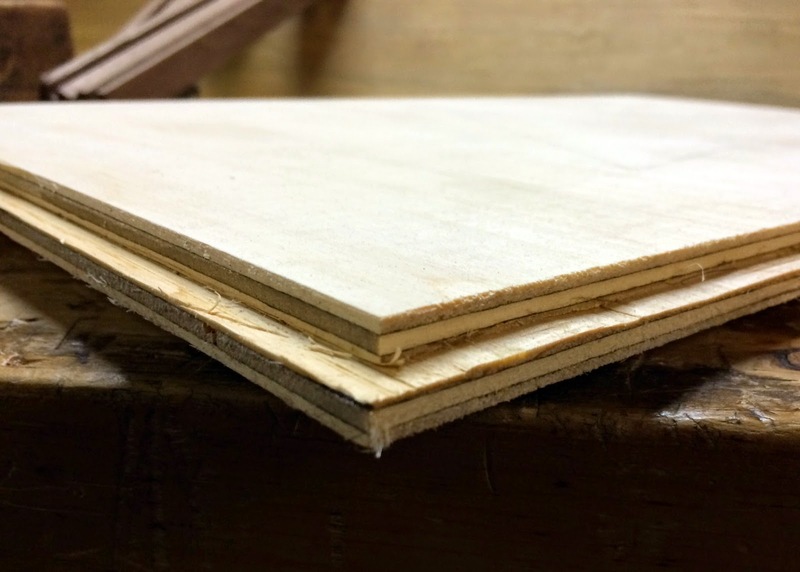 I picked up a section of 1/2" sanded plywood from the box store. Searching through the pile I actually found a show face that had a some curly figure to the grain. Back at the shop I cut the ply into three blanks 17 1/2" x 11 1/2", then I used the table saw to cut 1/4" x 1/2" rabbets all around the border. I ripped down some 1" thick black walnut into 1 1/4" wide pieces. planed them flat and smooth and plowed grooves to accept the lip of the plywood'e rabbet. 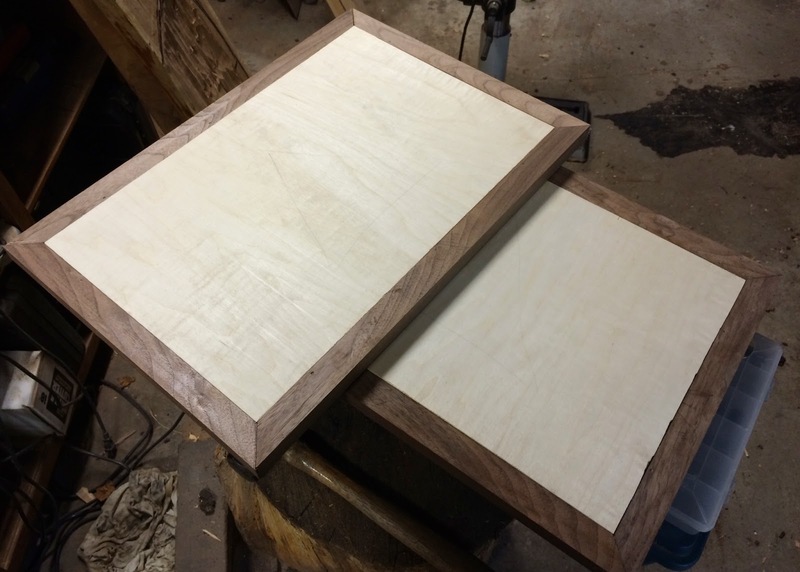 I mitered and fitted the walnut into frames around the plywood. 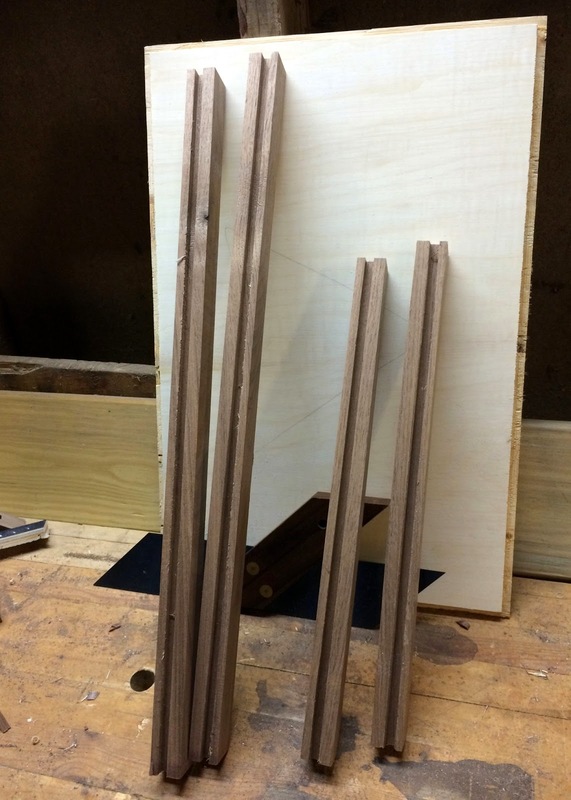 glue into the plowed grooves and some finishing brads to hold the frames in place. You may wonder why I used 1" thick frames and 1/2" ply. In essence the rabbet acts as a bare faced tenon and provides more strength to the joint, but it also leaves a slightly less than 1/2" recess in the back of the boards. With a couple of wide rubber bands,(a common accessory to drawing boards) they can easily place a sketchbook and maybe a tin of pencils in the recess and carry the whole thing by the handle where ever they want. I finished the boards with danish oil and a light furniture polishing wax and added a single screen door handle to one side. A fun little weekend style project that my girls will use for many years. How much better does it get. Just one more decent sized shop distraction to handle and I can get back to the medieval furniture I've immersed myself in lately.